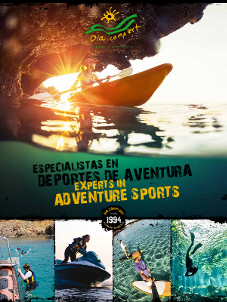 Through this contract Dia Complert (Dia Complert d'Esports i Activitats Adventure, CB NIF E57142234 and address in Fornells, Avd. Passeig Marítim, 41, 07748 Menorca) sells customer (any natural or legal person that subscribes any Dia Complert sales contract catalog) and this purchase Dia Complert the product specified on the invoice. It is meant 'contract' trading operation that is implemented by this document. It is meant 'product' the contract goods purchase. The information in our database for the products that have ever entered our catalog. We assume no responsibility for any typographical or arithmetic error that could be included in our page. Product payment will be made online by credit card or debit card. Dia Complert will present the invoice to the customer digitally sending by email or at the time of the purchase order. The card charge will be made at the time of purchase. Once hired and paid for any of our services through our official website, you can cancel with a minimum of 48 hours of the date of the activity or activities, attaching a receipt as you are not able or is not possible to do the activity. In case of cancellation by the company due to bad weather or any other inherent to the same reason, it will be postponed to another day available by the customer. Should not have more days to perform the activity, you will have to be justified by boarding pass with departure to justify not have more days or any other document attesting to the non-availability for the activity on a subsequent day . In case of not be to the time we arrange to do the activity, the customer loses the right to do the activity another day or refund the money. If you buy a pack of 2 activities and can only enjoy one, you have to pay the individual price of the activity enjoyed (as if only the activity arranged is bought). If you buy a pack of 3 activities and enjoy only two will have to pay the price of pack of 2 activities. For cancellations you can contact by phone 609 670 996 or sending mobile email info@diacomplert.com. In compliance with the provisions of Law 15/1999, of December 13, Protection of Personal Data, at the time a customer places an order, your personal, domiciliary data and those relating to payment they are incorporated into our database, used solely to process the order and send information on offers and services that may be of interest to our customers. Dia Complert ensures confidentiality of data provided by our customers, as personal data requested are always strictly necessary. If you have any question you can contact us and we will be pleased to help you and explaint to you any doubt.